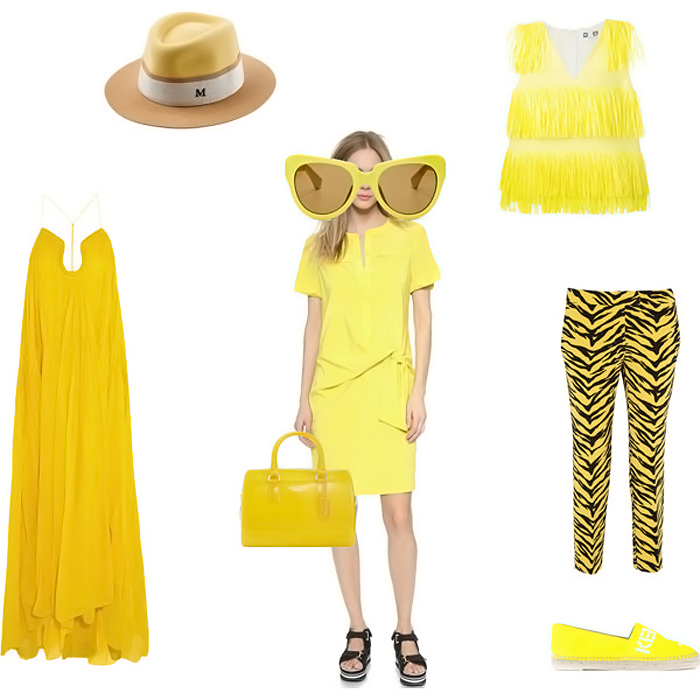 The most sunny color is about to take our wardrobes in Spring/Summer 15 season. "The dark days are gone, and the bright days are here, My Sunny one shines so sincere." So this is the moment when fashion meets music. We are having the Sunny fashion season with legendary Boney M song. Designers couldn't get any more positive and seasonal this Spring/Summer but to give us a real splash of sun rays. So, even if the sun is going to hide behind the clouds you have a chance to become a real Earth-ly sun by putting all yellow everything. Or take it simple by having one statement yellow piece, as if your are that one ray of sun that managed to get through the clouds. So taking the best of yellow from designers and brands like Chloe and Alexander Wang let's have another virtual tour around what sun inspired pieces are going to be big pretty soon. Yellow dress is a statement of them all. No matter the length, the style and the occasion yellow color will make this dress work. Work for you, of course. A very must-have for upcoming Summer. Sweater with zebra or cropped top. That's the question. Here's a trick - take one for gloomy and cold days, the other for Summer-ry hot days. And one more top for a special occasion like party, date or friend's wedding. Girls adore bags. When bags are taken to seasonal trend level it becomes a sort of a desire for inveterate fashionistas. So here we go with many interesting, cute and even funny options. What can be better than a bag that doesn't only brighten up the world around, but also wishes every single passer by 'a nice day'? Probably one of the top options we would love to put in our wishlist. Walking on sunshine? Yes, please. Another sun inspired song that relates to yellow trend, by Katrina and The Waves. Though this one was definitely written with yellow shoes in mind. Yellow shoes come in every option possible - starting with flats and sandals and finishing with sport shoes and high heels of every style. Make your life path brighter with one of these pairs. Take the yellow trend straight to accessories. It can be a tricolor near to iconic wide brimmed hat. Or sunny yellow sunnies (and, yes, there is a song about yellow sunnies). Key chains, phone cases... Yellow accessories will definitely pop here and there sooner than you expect, so don't underestimate its power.